The only recognizable face is part of Bruce Campbell, but will be in a cameo towards the end of the film. Another thing that will change the characters and some story details, while keeping the basic outline of friends who are beleaguered by demons in a cabin alone. Speaking as one of those die-hard fans — should we refer to ourselves as Dead-Hard Fans? no, never mind — this is a refreshing thing to hear. At its core, Evil Dead is a horror movie with silly, demented moments about people fighting zombies and demons while in a dangerously remote, albeit cozy, cabin in the woods. There is always room for interpretation there and a new story to tell. But the real question is: Will they dare try to replace Ash? They can’t. Even under the trusted eyes of Diablo Cody (seriously, see Jennifer’s Body — she is absolutely to be trusted with an Evil Dead script), who will be taking a pass at this story in the rewrite phase, nobody wants to see some kid try to be Ashley J. Williams aka The Idiot Ash. Not even Nathan Fillion, not even Isaiah Mustafa. They would be great in an Evil Dead movie, but they cannot be Ash. Ash is Bruce Campbell. As directed by a Three Stooges-inspired Sam Raimi. Might there be someone new? Maybe. But there can only be one Ash. Campbell has already said that he will not be playing the lead in this, but has he completely ruled out playing Ash for his cameo? Maybe Ash is the only man who can ultimately deal with the Deadites in the woods. or maybe he’ll just show up and make things worse, which would be pretty amazing. Watch this space for further speculation. 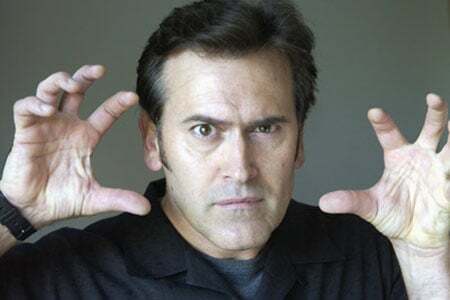 Or just follow Bruce Campbell on Twiiter.